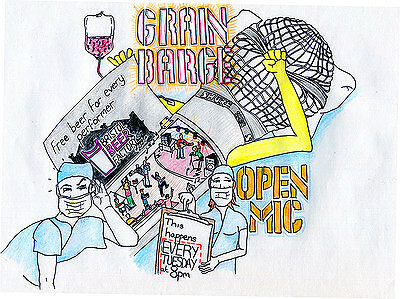 The world-famous Grain Barge Open Mic Night. Your host, rapping violinist, Mike Dennis welcomes music, comedy, poetry, theatre acts of all styles, ages and abilities as long as you can squeeze it into ten minutes! Sign up from 7pm. Start at 8-8:30pm. Last slot at 10:50pm.